The Li-Arp from Watt Stopper/Legrand can reduce the cost and complexity of lighting control projects that use layered control strategies to maximize energy savings. Designed for areas with small lighting-control zones, the panel localizes power handling and intelligent control by placing relays close to the control areas. 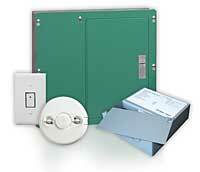 The pack provides two relay outputs to support bi-level switching and manual-on operation. It is also equipped to accept inputs from occupancy sensors and daylighting controls. Engineers can optimize the electrical system by feeding multiple relay packs from a single circuit breaker, fully loading each circuit.